If you’re anything like me, the end of winter brings with it a certain kind of stir-crazy that can morph into planning a slew of projects for the house or garden. 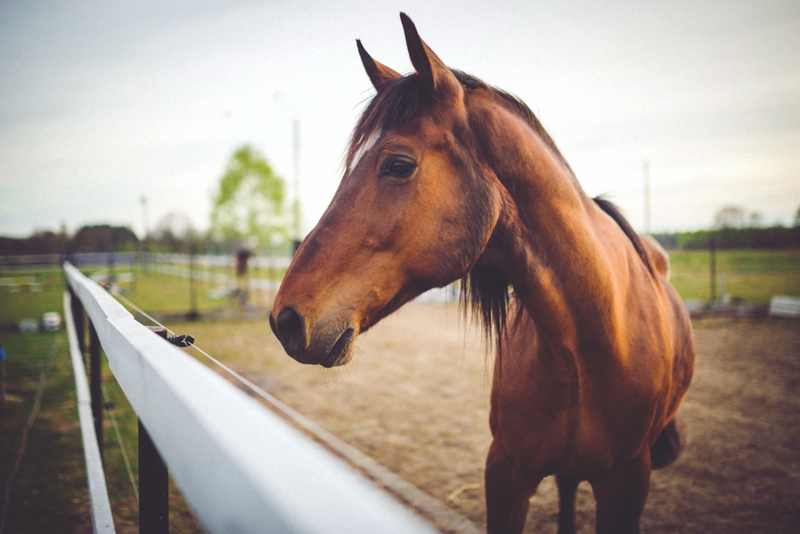 If you’ve recently bought acreage though, it’s possible your sights are on something bigger—like that barn you’ve always dreamed of for your horses. But if you’ve done any research into the matter, you have probably figured out that those magazine-ready architectural marvels are way too expensive, right? 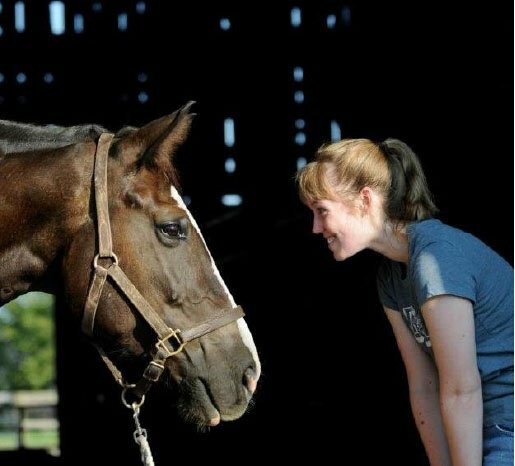 Not so fast, says Georgia Hickey, equine facilities designer for King Construction Company in New Holland, Penn. Even if your budget isn’t in the seven figures and you’re not building a barn for 20, you can still draw inspiration from those bigger projects. The biggest thing that makes barns look and feel expensive is the same thing that creates such an effect in houses: lots of natural light. Hickey recommends keeping the eave height at least 12 feet instead of the traditional nine or ten. Barns without lofts can have skylights or clerestory (a higher section of wall lined with windows) to draw the eye upwards and let in natural light. Barns with lofts can benefit from windowed Dutch doors with transom windows above, as well as doors with windows at the ends of the aisleways. Windowed cupolas are an eye-catching feature on pricey barns, but Hickey warns they will up the price, since extra framing work is needed to enclose the chute of the cupola from the loft, if there is one. 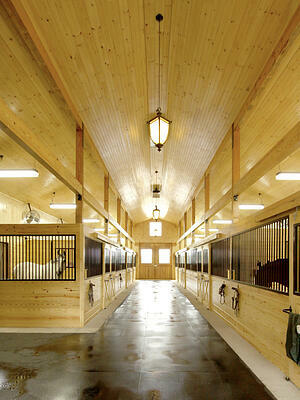 The exchange of light and air flow between stalls gives the barn a more open, airy feel, too. Instead, Hickey says, opt for a standard, solid door on the bottom and a drop-down yoke up top. This type of top door will have the traditional grill, with the option to drop down a u-shaped section so a horse could stick his head out. The other option is to put a heavy steel screen or grill in place of the bottom door. Top-of-the-line barns are also experimenting with different types of partitions between stalls, mixing lower walls with different styles of grill or mesh to allow horses to interact with each other. This only works well when you have neighbors who get along, however—and feed time can bring out the attitude in everyone. Hickey prefers the “gossip grill”—a cutout mesh or metal grill “window” in the stall partitions that allows neighbors to swap tall tales when they feel like it, yet retreat to their corners at dinner time. 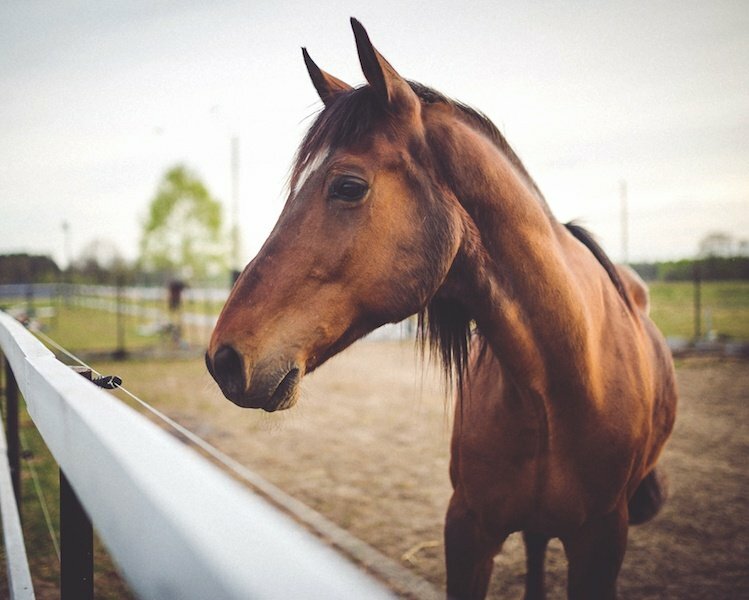 When it comes to flooring, everyone loves the look of rubber brick pavers—they’re attractive, durable, and gentle on equine and human feet. They’re also expensive. Hickey suggests reserving those for grooming or hosing areas and using recessed rubber mats in the aisles. By placing them down next to concrete curbing, they won’t move and can take water just as well as the pavers. Hickey suggests saving money in some areas to splurge in others. The most important spend, she says: Electrical. More lighting—especially in stalls and grooming areas—will never go unappreciated. Make things easy on yourself: If you can spring for automatic waterers and fly spray systems, do it. You’ll save cumulative hours refilling buckets and fussing with sprays. Automatic waterers are now easier than ever to clean and even come with consumption gauges so you know if your horse is drinking. Little expenses that make a big difference: good insulation and a climate-controlled tack room – even if it’s just from a window or through-the-wall unit. There are also places you can save, too. Order siding and trim pre-painted or stained to save time and money. Go with the standard 29 gauge metal roof—it will last three to five decades. And don’t go crazy on the type of window. Just make sure you use tempered glass on aisle and Dutch doors. One final thing that people don’t think of which makes a big visual difference: Finish the ceiling.